In the Pantheon of Heuer racing gods, we are accustomed to seeing Mario Andretti, Steve McQueen Jochen Rindt and Jo Siffert at the top of the roster. Yes, if there were a Mount Rushmore of the Heuer heroes, we could expect to see these four faces. Indeed, it is fitting that collectors refer to four specific Heuer models, as the “Andretti”, “McQueen”, “Rindt” and “Siffert”. 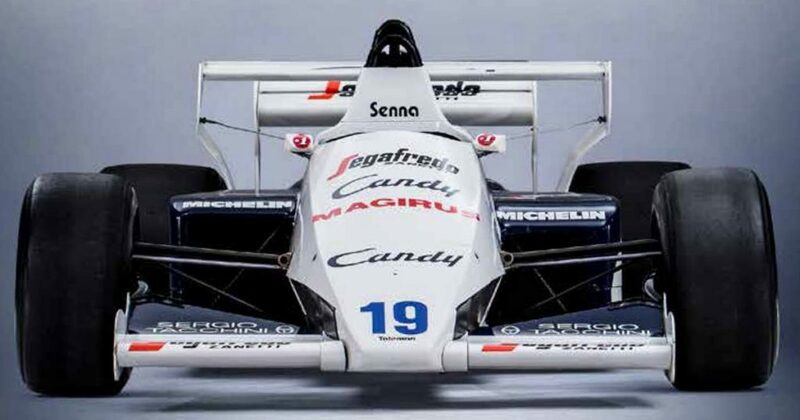 Lengthen the list and widen the mountain, and Ickx, Lauda, Regazzoni and Villeneuve might be the next racers named by today’s collectors. But to make these lists is to face the problem – what are our criteria for deification? Are we looking for the best drivers? Those who wore the Heuers most often? Those who supported the brand? Or perhaps the most romantic (or tragic) figures? 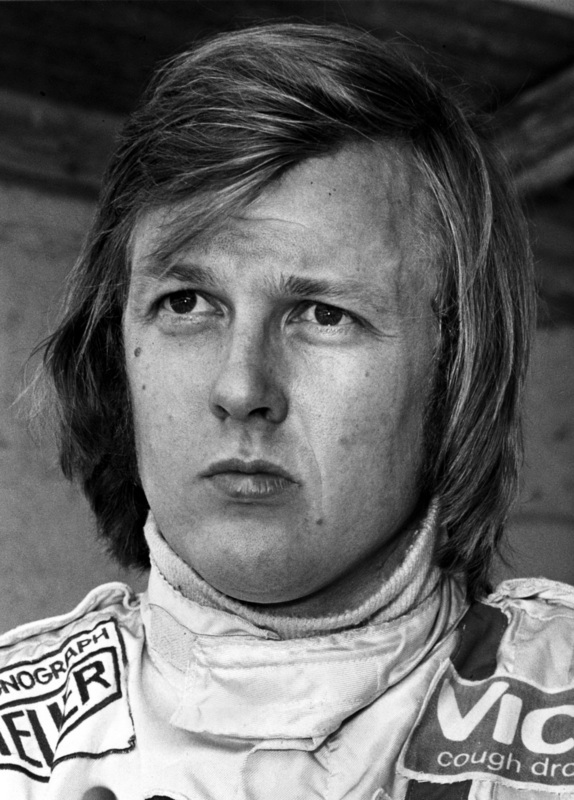 Today, I emerge from several days in the photo archives, the old Autocourse books and the YouTube videos to make the case that, almost 40 years after his death, Ronnie Peterson deserves a more prominent place among the Heuer racing gods. 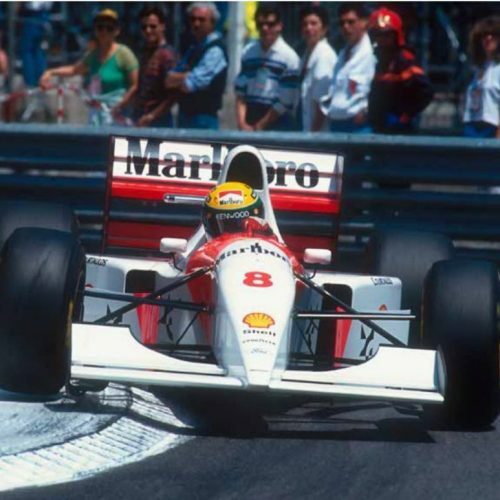 We know the phrases – one of the best drivers in history to not win a Formula One world championship . . . the beloved “Super Swede” . . . husband of Barbro . . . father of Nina . . . teammate of Mario . . . carried to his grave by drivers James, Jody, Emerson, Niki and Gunnar. 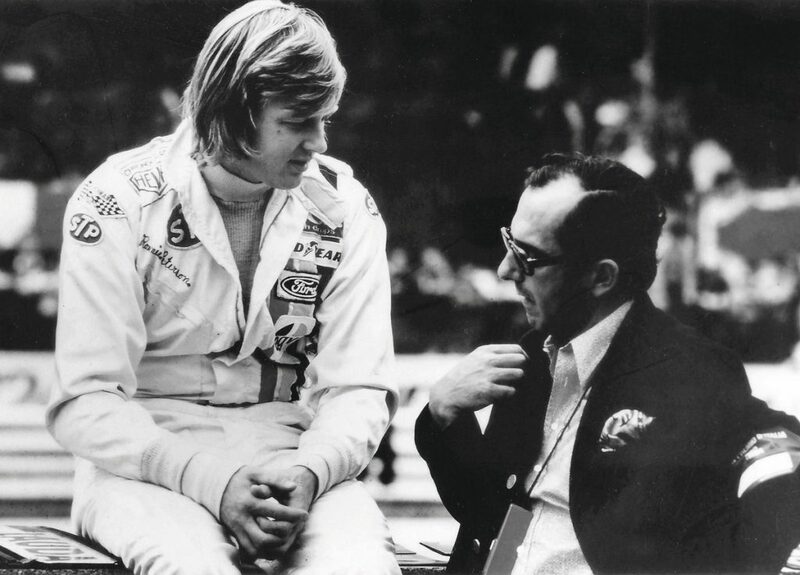 But today, we focus on a different friendship, the friendship between Ronnie Peterson and Jack Heuer, the racing enthusiast who served as the fourth generation head of his family company. 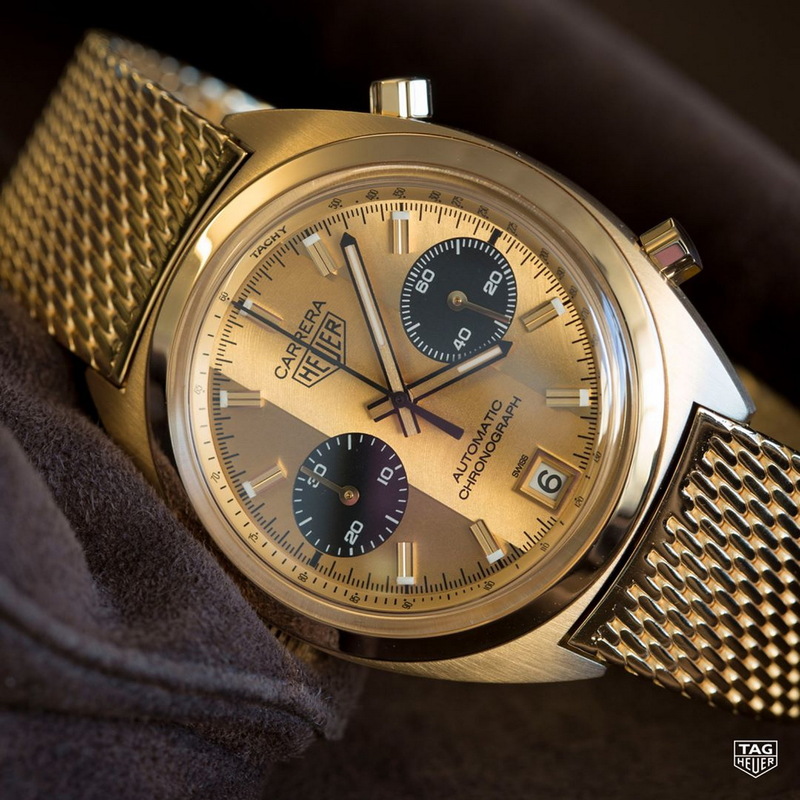 In the 1970s, Jack Heuer gave Ronnie Peterson the gift of a watch; in 2016, TAG Heuer bought that watch for its Museum; in 2017, TAG Heuer created one near-exact copy of that watch, as a tribute to Ronnie Peterson. 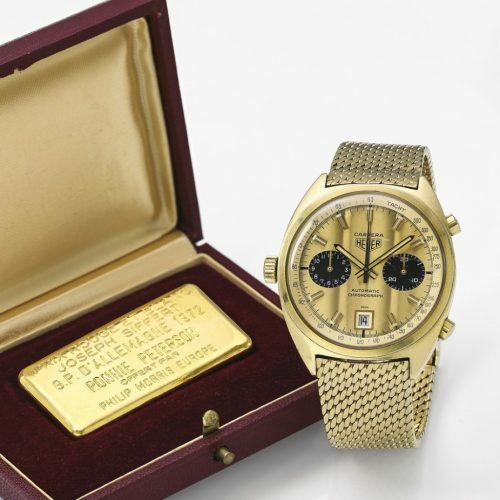 In a few days, Bonhams auction house will sell that watch, with the benefits going to the Ronnie Peterson Foundation. But we start with the watches. In 1969, Heuer introduced its three lines of automatic chronographs, the Autavia, the Carrera and the Monaco. The Monaco was an entirely new model, in its distinctive square case, but the Autavia and Carrera models continued their run from the early 1960s. With the use of the Calibre 11 movement, however, Heuer needed larger cases, so the traditional round cases of the Autavia and Carrera gave way to new C-shape cases. The Autavias had an outer rotating bezel, initially marked with either a tachymeter or minutes / hours scale, and the Carreras had a fixed inner bezel, marked with a tachymeter scale. All these initial automatic chronographs were powered by the Caliber 11 / 12 movements, meaning that the crown (for winding the watch and setting the hands) was on the left, with the pushers (to operate the chronograph) on the right. The entire line-up of new chronographs used stainless steel cases, with one exception — an 18 karat gold version of the Carrera (Reference 1158). 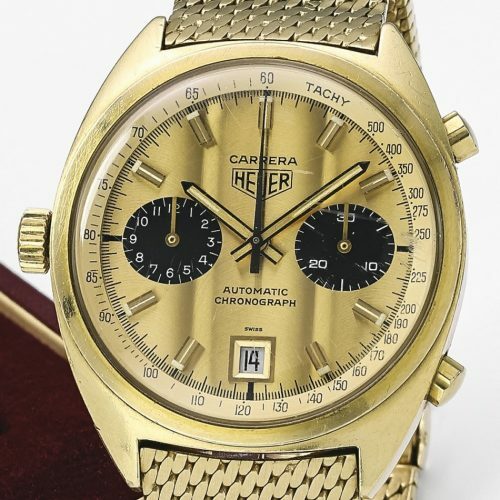 This watch was the successor of 18 karat gold Carreras that Heuer had offered throughout the 1960s. 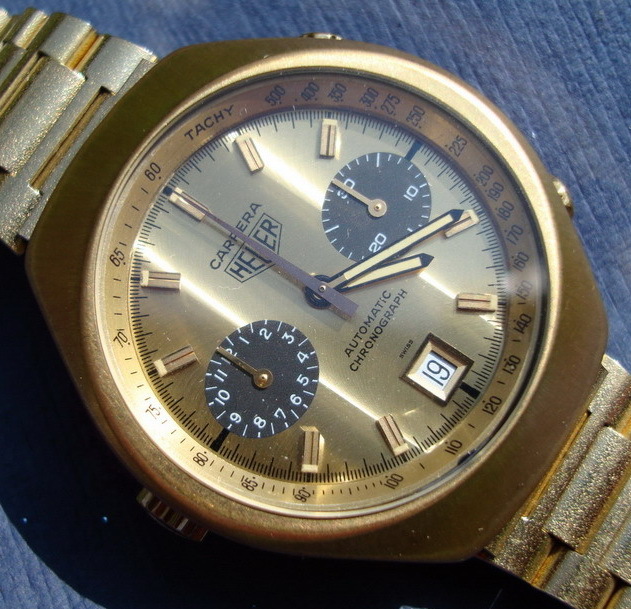 Later in the 1970s, Heuer would offer the automatic movement in a gold-plated Carrera. Over the period 1969 through 1979, there were seven versions of the Reference 1158 Carrera (as shown HERE). 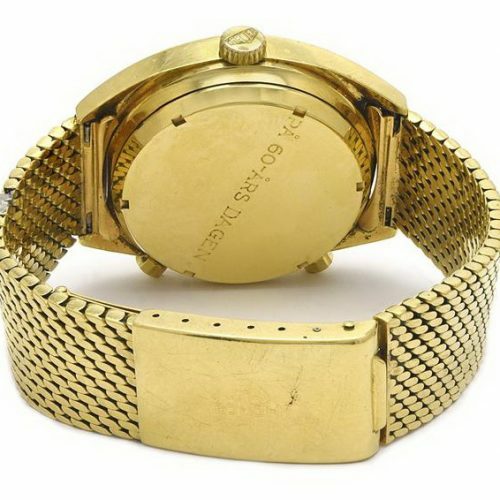 All models used the same 18 karat gold case, and offered 12 hour chronograph capacity, with an hour recorder (at nine o’clock) and a minute recorder (at three o’clock). 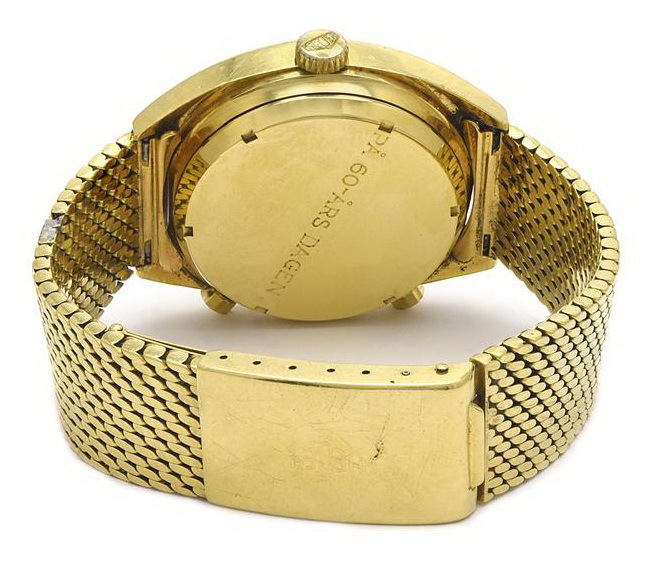 Dials were silver (white) or champagne; registers either matched the dial or were black; and the watch was offered on either a Corfam strap (imitation leather) or an intricately constructed Milanese mesh bracelet. 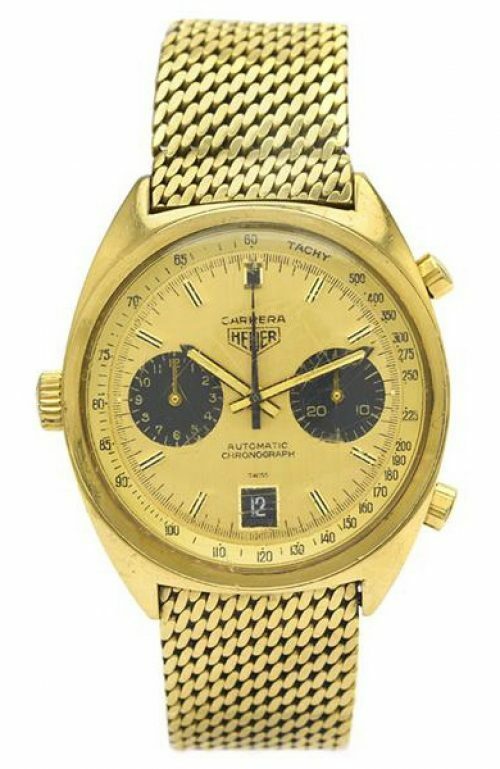 This Carrera was always the most expensive watch in the Heuer catalog, typically costing six to eight times as much as a standard Carrera or Autavia. 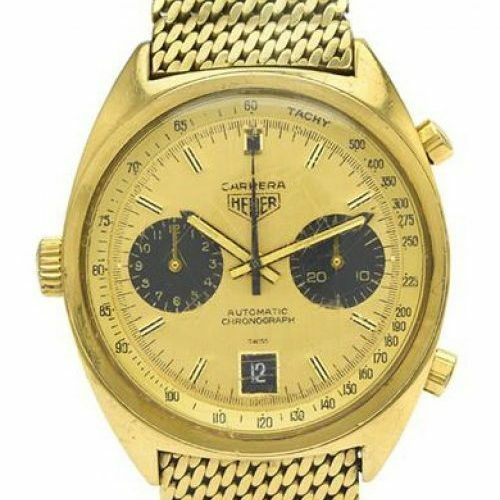 At periods during the 1970s, the bracelet alone cost twice as much as the Carrera itself, so the shopper had a choice of one 18 karat gold Carrera on its special bracelet or a box filled with 12 to 15 of the ordinary stainless steel models. 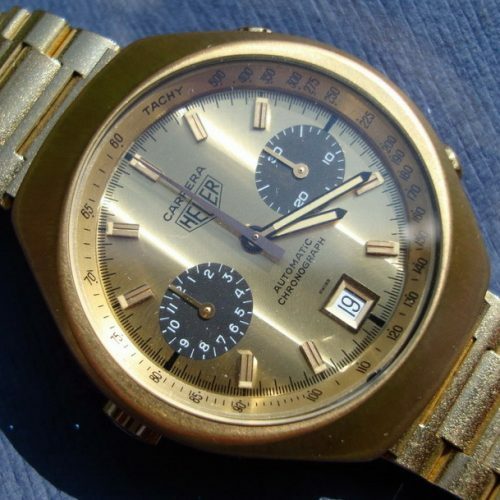 TAG Heuer reports that it sold a total of approximately 500 of these 18 karat gold Carreras over this period. The story of Jack Heuer presenting these 18 karat gold Carreras to the Ferrari drivers is well-known. We have seen numerous photos of Regazzoni, Andretti, Merzario, Lauda, Villeneuve and other Ferrari drivers wearing these watches. Less widely known is the fact that Jack Heuer presented several of these Carreras to ambassadors who represented the Heuer brand during this period, and also to a few other friends. 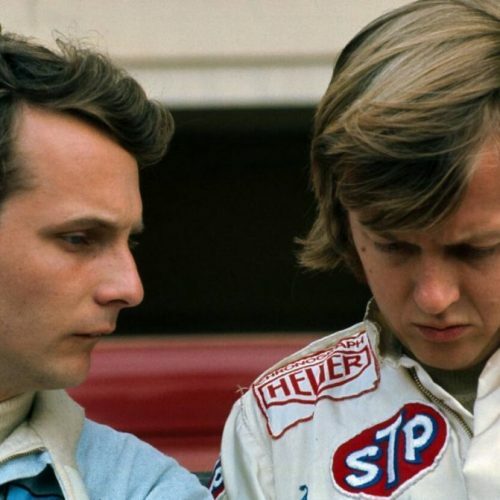 Ronnie Peterson drove for the March and Lotus Formula One teams throughout his career (1970 through 1978), but Jack Heuer maintained a friendship with Peterson and had enlisted him as a Heuer ambassador, as evidenced by the “Heuer Chronograph” patch that he wore on his racing suit. 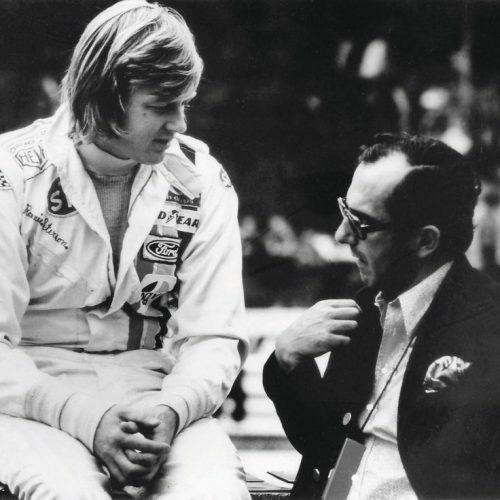 Jack Heuer has recently recalled that he enjoyed chatting with Ronnie Peterson and his wife, Barbro, at the races. The relationship with Peterson was especially important to the Heuer brand, as Sweden was an important market at that time. 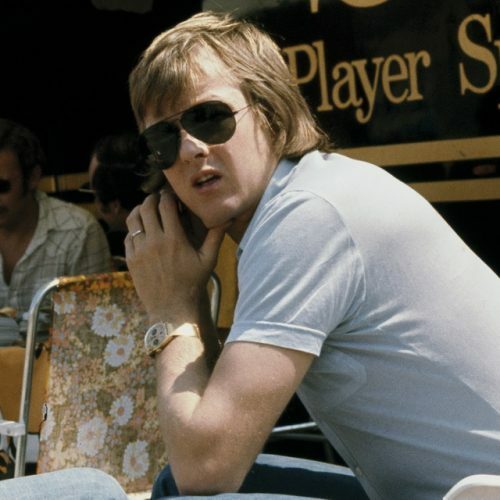 In 1972, Jack Heuer presented Ronnie Peterson with the same model 18 karat gold Carrera that the Ferrari drivers were wearing, the Reference 1158 CHN model (meaning that it had a champagne dial and black registers). 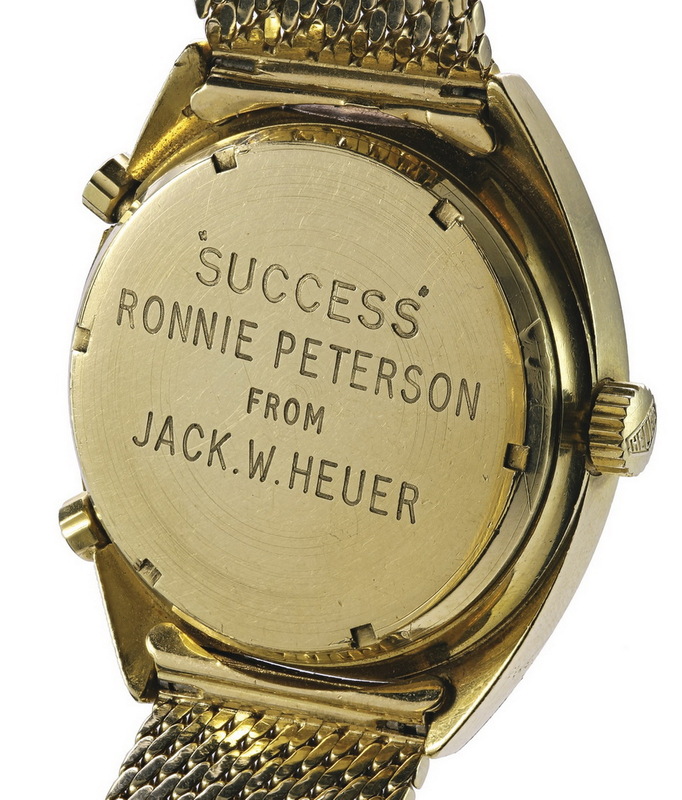 Jack Heuer had the Carrera engraved, “Success / Ronnie Peterson from Jack Heuer”. 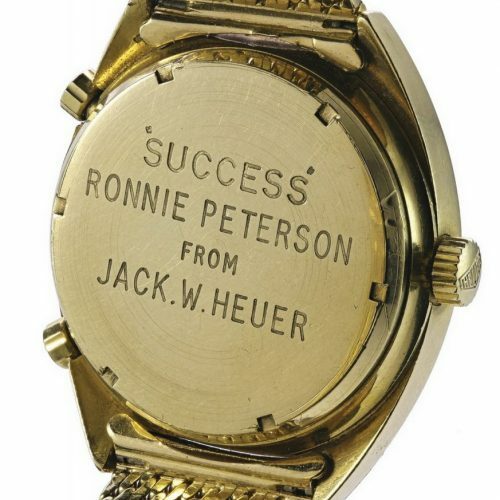 Jack Heuer has confirmed that the “Success” referenced in the engraving did not refer to any specific race, event or undertaking between Peterson and Heuer, but was a general expression of Heuer’s good wishes for Peterson’s racing career. 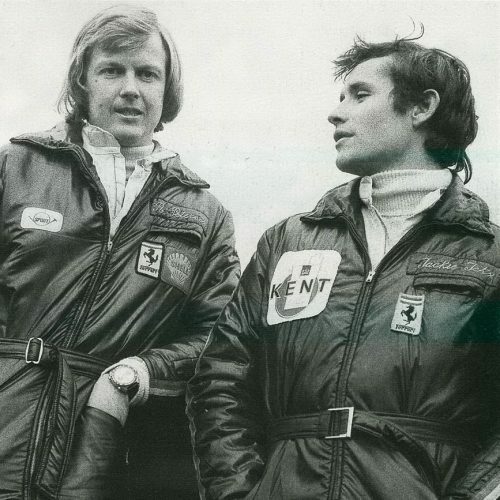 The watch that Jack Heuer presented to Ronnie Peterson is different from the standard production Reference 1158 Carreras. The dial on the Peterson model has the usual champagne tone, with contrasting black registers, but the Peterson Carrera has a Cotes de Geneve finish, with the dial divided by vertical lines, into three distinct areas. Closer inspection shows that the registers on the Peterson Carrera are an oval shape, rather than the round shape of the Reference 1158. This appears to be a dial from the Reference 110.515 CHN Carrera, which used a barrel-shaped, gold-plated case, introduced in 1974. 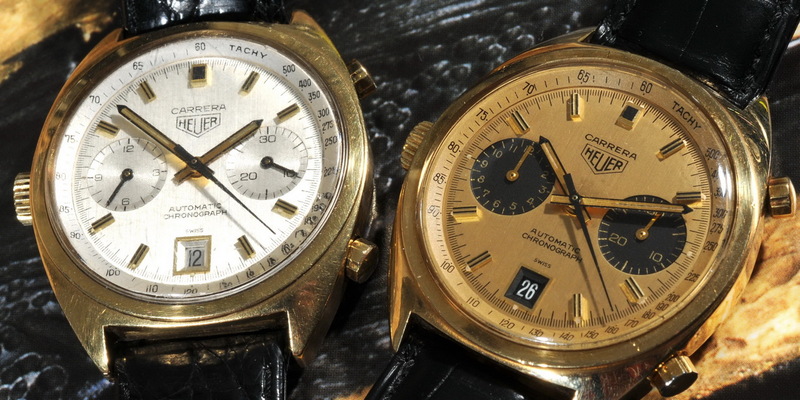 The best explanation for this one-off Carrera is that Jack Heuer needed to make a gold Carrera for Peterson after the production run of dials for the Reference 1158s (or perhaps a batch of dials) had been exhausted, so he used a dial from the 110.515 Carrera, which would go into production in 1974. The case number of Peterson’s Carrera (174277) offers some support for the idea that the watch was specially made, from available parts, as the serial number dates the case to 1969/70. A less fortunate explanation would suggest that Peterson’s Carrera originally had a standard Refernece 1158 dial, but the dial was subsequently replaced with the 110.515 dial, in servicing. This explanation seems less likely, however, with no evidence in support of the theory. Regardless of how this dial got into this Reference 1158 Carrera, it is a unique combination, that has not been seen in other samples of the Reference 1158 Carrera. 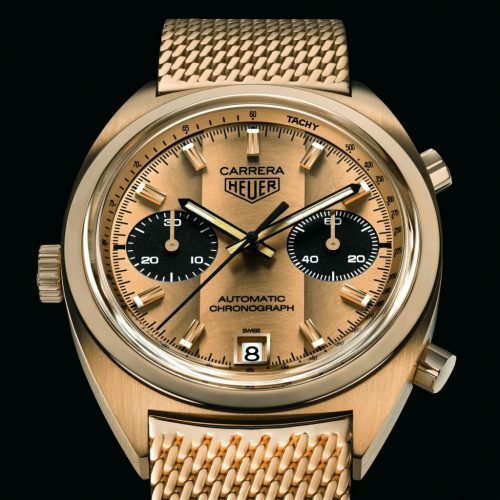 Whatever the peculiarities of the dial may be, one feature of the Ronnie Peterson’s Carrera is especially notable – the 18 karat gold “Maglia Milanese” (Milnese mesh) bracelet. While the case of a Reference 1158 Carrera contains approximately 48 grams of gold, the bracelet is made of 73 grams of gold. 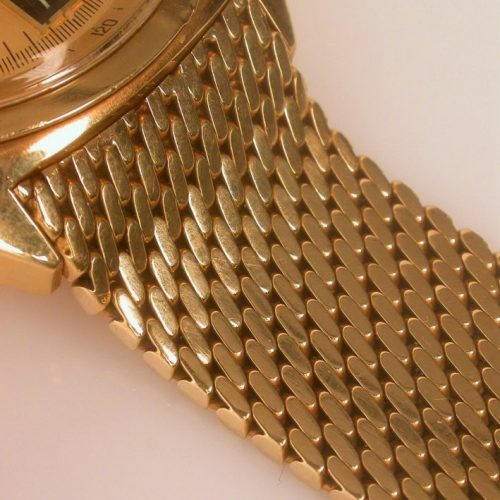 Consider the intricate construction of the bracelet, with its hundreds of tiny links, and we see why the bracelet itself cost over twice as much as the watch, in the mid-1970s. These Milanese mesh bracelets are exceedingly rare, with an average of only one or two seen on the market in a given year. 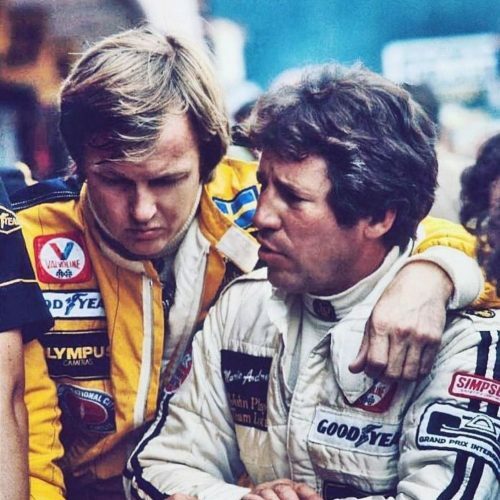 We see a fair number of photos of Peterson wearing his gold Carrera during the period from 1974 through 1976 (although no photos of him wearing any watch while racing). Later, he seems to have switched to a gold Rolex, perhaps to match the watch favored by his wife, Barbro. Ronnie Peterson must have enjoyed his 18 karat gold Carrera. In late 1972, Ronnie and his brother Tommy ordered a Reference 1158 Carrara, as a 60th birthday present for their father. This Carrera appears to have been a standard production model (serial number 240012), with a champagne dial and black registers. Brother Tommy inherited this watch from his father, and sold it in an auction in November 2016. Ronnie Peterson’s Carrera – Sold to the TAG Heuer Museum. Ronnie Peterson’s 18 karat gold Carrera was sold by members of his family, through an auction by Sotheby’s on May 14, 2016, in Geneva. 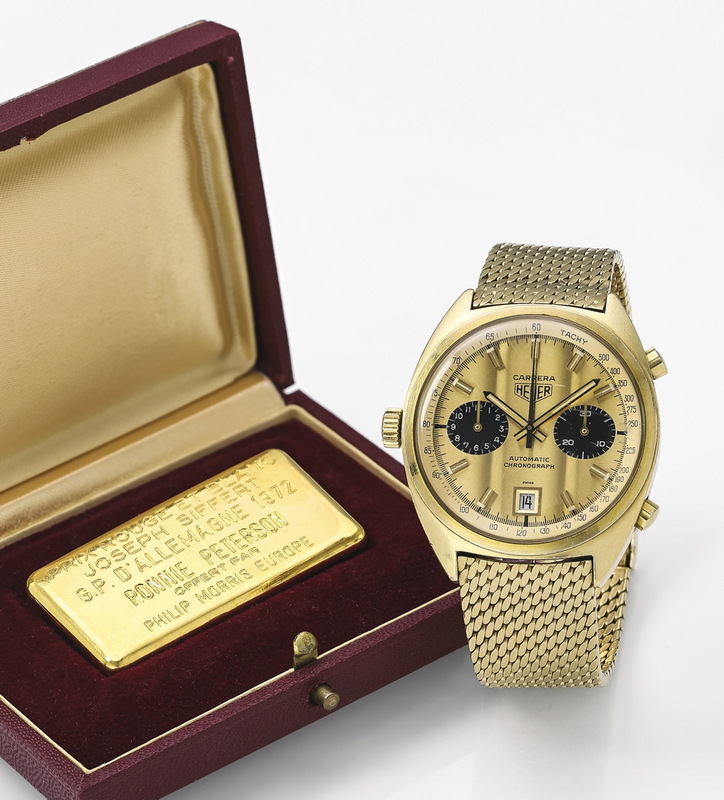 TAG Heuer was the winning bidder, at a price of $230,000, the highest price ever paid for a Heuer chronograph that had not been worn by Steve McQueen. You can see the listing (Lot 161) in the Sotheby’s catalog, HERE. 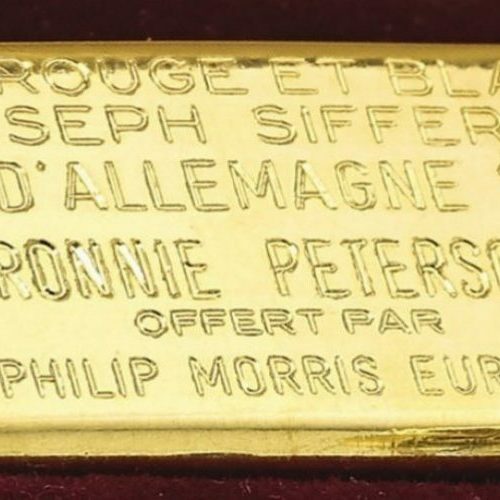 Accompanying the 18 karat gold Carrera in the sale was a 100 gram gold bar from Société de Banque Suisse, awarded to Peterson as the “Prix Rouge et Blanc Joseph Siffert”. 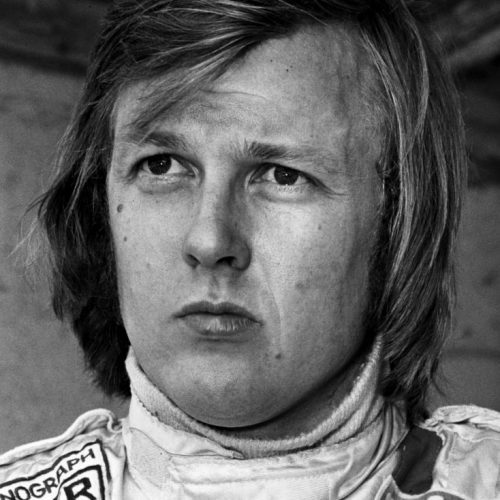 In the early 1970s, journalists at each Grand Prix voted on the most impressive driver, and Ronnie Peterson had been the recipient of this award for his performance at the Germany Grand Prix in 1972. Peterson finished third in this race, as Jacky Ickx won the pole, led every lap, and won the race. In 2017, TAG Heuer released a limited edition Carrera chronograph, derived from the original watch that Jack Heuer had gifted to Ronnie Peterson. 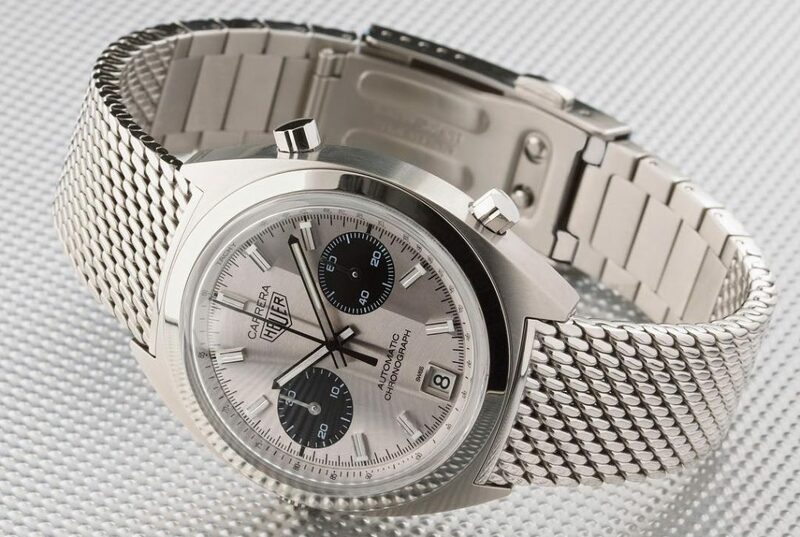 This new stainless steel Carrera (Reference CBH 2210) was produced in connection with the film about Peterson, SuperSwede, and was available only in Sweden. This new Carrera adopted key elements from the original Peterson Carrera, except that stainless steel was used instead of 18 karat gold. 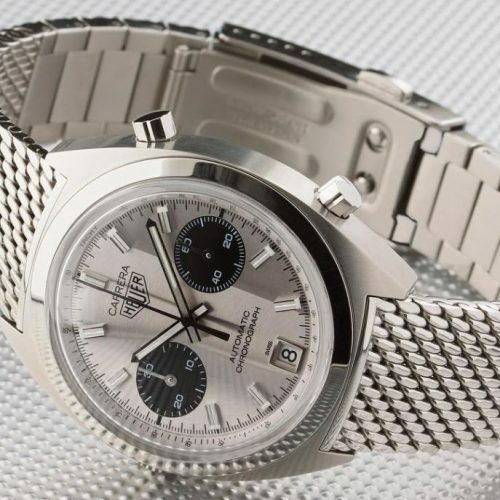 The C-shape case has the size and shape of the original 1158 Carrera; the dial has the Cotes de Geneve finish and oval registers; and the bracelet is constructed on Milanese mesh. This new Carrera is powered by the TAG Heuer Calibre 11 (made by Sellita, with a Dubois-Depraz chronograph module). The Limited Edition was limited to 40 pieces and priced at 85,000 SEK, with all of them selling out quickly. 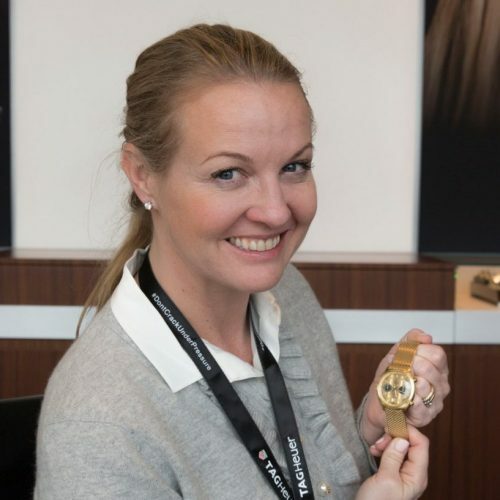 When TAG Heuer introduced the Limited Edition Carrera for the Swedish market, it announced that, in addition to the 40 stainless steel pieces, there would be a single watch produced in 18 karat gold. To the extent possible, the new 18 karat gold Carrera (Reference CBH2240.BG0673) would match the watch that Jack Heuer had given to Ronnie Peterson. Like the original Reference 1158 Carrera gifted by Jack Heuer to Ronnie Peterson, the replica has a champagne dial, divided into three sectors, with a Cotes de Geneve finish. The registers are black, with the same oval shape as the original, except that rather than having a 12-hour recorder and a 30-minute recorder (as on the original), the new watch has a 30 minute recorder and a register for running seconds. Both watches have a date aperture at six o’clock, and the gilt baton hands with black accents and luminous inserts. The center chronograph hand and other accents are black. The new Carrera not only mimics the construction of the original watch, but it has the same engraving on the case-back – “Success” Ronnie Peterson from Jack W. Heuer. 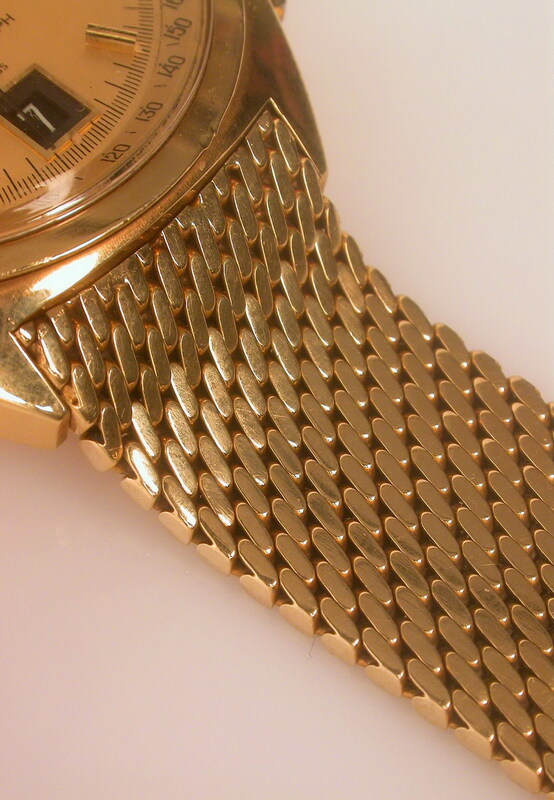 The bracelet of the tribute watch is also 18 karat gold, with the same Milanese mesh construction as on the bracelets from the 1970s. On Friday, May 11, 2018, Bonhams will hold its “Le Grandes Marques a Monaco” sale. The sale will include vintage race cars, other vintage and historic cars, and a variety of auto memorabilia. 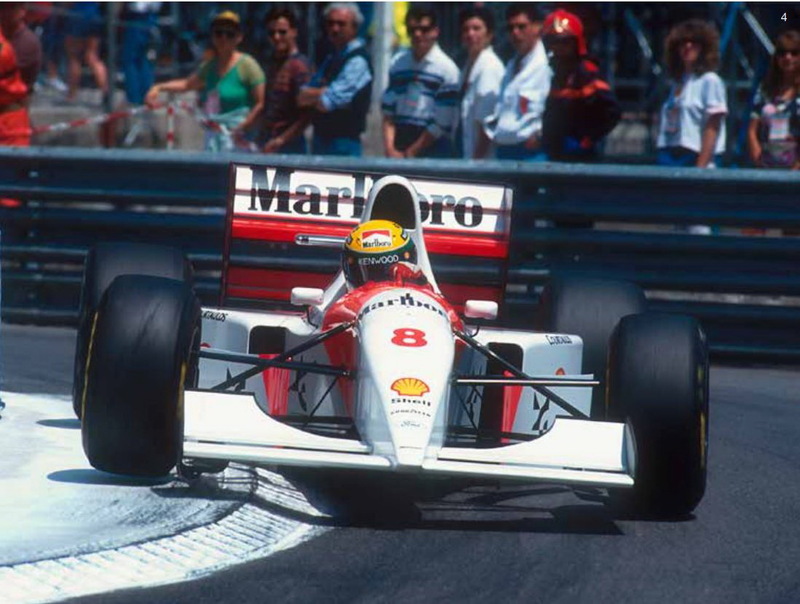 Among the race cars will be the 1993 McLaren-Cosworth Ford MP4/8A, Formula 1 car raced by Ayrton Senna (Lot 119); the 1984 Toleman-Hart TG184 Formula 1 car raced by Senna (Lot 124); and the 1987 Ferrari F1/87 Formula 1 car raced by Michele Alboreto (Lot 135). 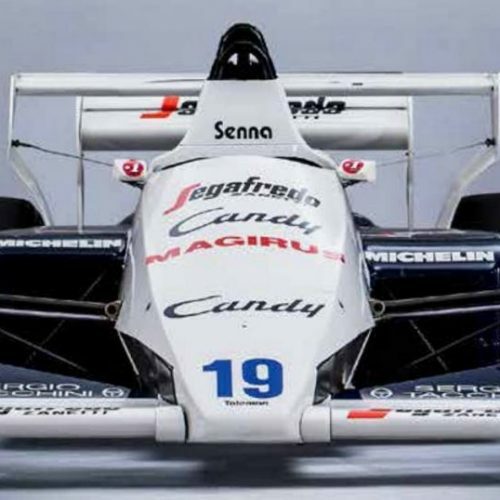 The sale also includes the car that launched Peterson’s career on to the international stage, the 1969 Tecno-Novamotor Ford 69 Formula 3 Single Seater. 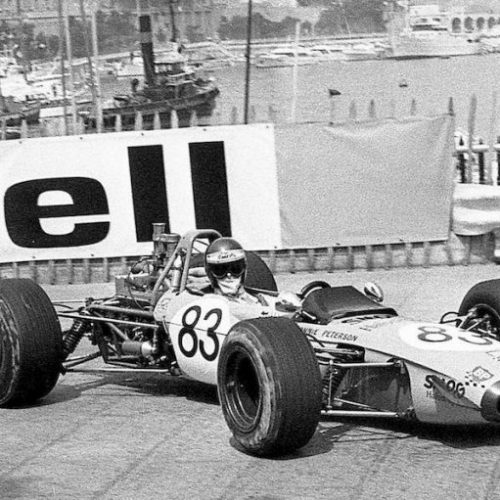 Peterson drove this car to 16 wins, including the 1969 Monaco Formula 3 GP. The one-off TAG Heuer Carrera produced as a tribute to Ronnie Peterson (TAG Heuer model Carrera Gold-RP-R, Ref: CBH2240.BG0673), will be sold as Lot 111. The watch carries an estimate of € 20,000 to 30,000 (US $ 24,000 to 36,000). Bonhams has announced that the daughter of Ronnie and Barbro Peterson, Nina Kennedy, will be present at the sale. A small footnote to all this – In December 2017, TAG Heuer CEO Jean-Claude Biver presented brand ambassador Cristiano Ronaldo with an identical 18 karat gold Carrera, on the occasion of Ronaldo wining his fifth “Golden Ball” (Ballon d’Ors), as soccer’s player of the year. The case-back was engraved, “To CR7, the best ever, 7.12.2017”, with Biver’s signature also included in the engraving. Still, we can say that the 18 karat gold Carrera being sold by Bonhams will be the only sample of this watch available for purchase by the public. But Wait, What About Ronnie Peterson’s Autavia? 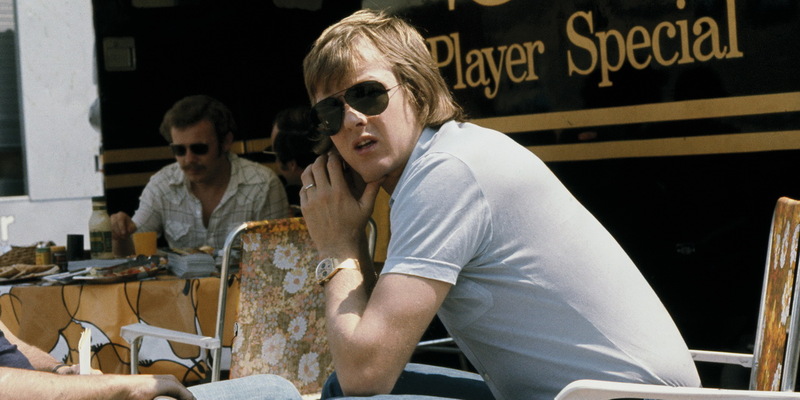 In the course of research for this posting, I studied hundreds of photos of Ronnie Peterson. One of these photos (from 1973) presents a new puzzle, as it shows Ronnie standing with Jacky Ickx and wearing a Heuer Autavia. Why was Ronnie Peterson wearing this Autavia? Where did he get it? Another gift or another purchase? And why don’t we see this watch in any other photos? My best guess — After Peterson became an ambassador for Heuer, but before he received the 18 karat gold Carrera from Jack Heuer, he received this Autavia. 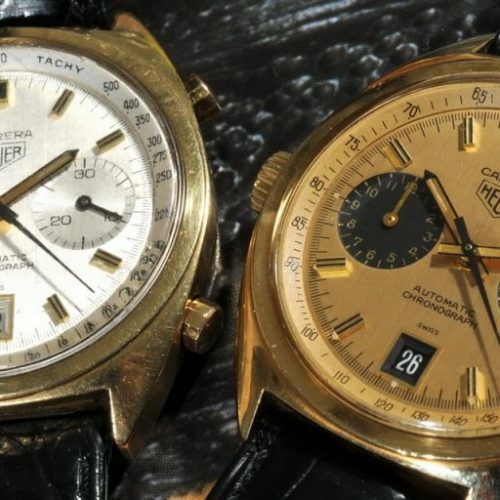 These watches were relatively inexpensive, at least compared with the gold Carreras, so he kept the Autavia even after receiving the Carrera, and wore it only occasionally. But that’s one of the exciting aspects of this watch collecting hobby, the forensic horology. For every puzzle that we solve, another one emerges, and perhaps there will be another posting some day, telling the story of Ronnie’s Autavia. The 1960s and 70s are called the “golden era” on motor racing, and watching the races, and reading about the racers, we see how much motor racing has changed. In the SuperSwede video, Jackie Stewart comments on the danger of the sport. Of the racers who competed for five years, two out of three would die on the track. So the racers were brave. 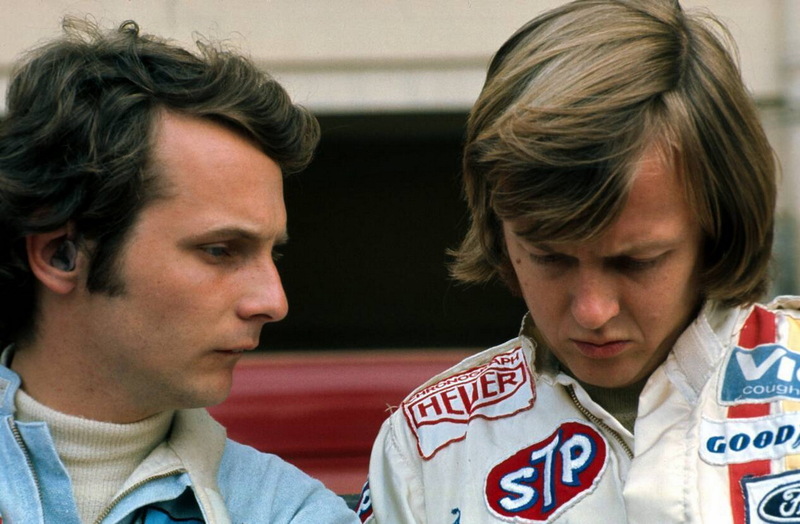 We also see a camaraderie among the drivers, as well as their friends and families, perhaps a bond that arose from the destinies they shared. They sit on the Armco, chatting, telling stories, or mingling with the fans. In the pits, or even in their cars, they seem more accessible, more visible than today’s stars. So these were the heroes of the 1960s, many of them tragic heroes. They wore watches because they liked them. The watches were part of their uniform, part of the romance, part of the mystique of being the coolest guys on the planet. And more than any other brand, in the 1960s and 70s, the racers wore Heuer chronographs. Ronnie Peterson embodied so much of this era, the raw speed, the courage, the friendship, the romance, and – ultimately – the tragedy. 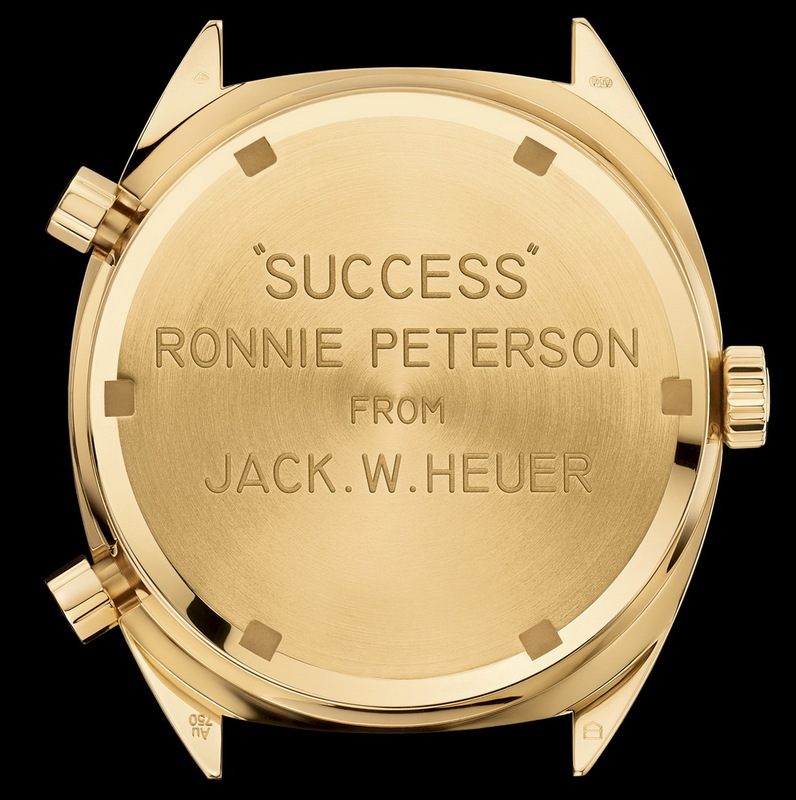 He wore a Heuer Carrera that not only represented his affiliation with the Heuer brand, but his friendship with Jack Heuer himself. Now, 40 years later, we see TAG Heuer pay tribute to Ronnie Peterson, to this Heuer hero, remembering him with a series of watches so closely connected to the one he wore. This is one of the reasons that we collect these old watches — whether Carreras, Monacos, Autavias or other Heuer models — to remember this era and to discover and celebrate these heroes.